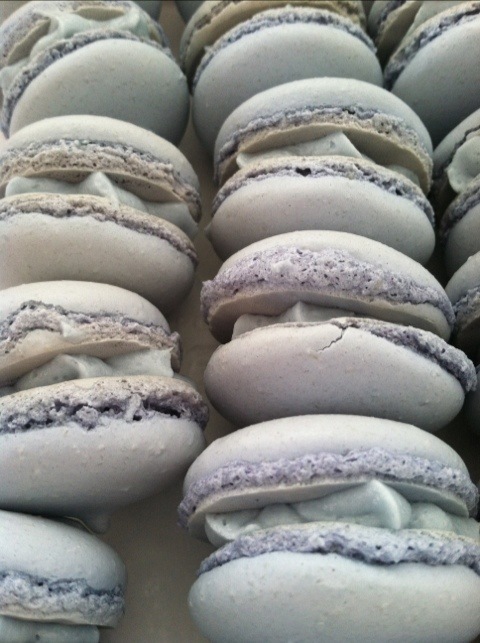 Mmmmm, I have a new love, macaron cookies! Not the American coconut ones, the French pastry ones! It took 4 tries (and 3 failed batches! ), but I got it right. Delicious! I made them in almond with almond white chocolate buttercream. So delicious! And gluten free!! I really should be careful with my gluten intake, but I do love my breads! All lined up, my piping skills need work, but not bad! In the oven, success! Nice shell and feet! And finally after two days of fiddling with recipes, measurements (a kitchen scale is essential!! ), voila! 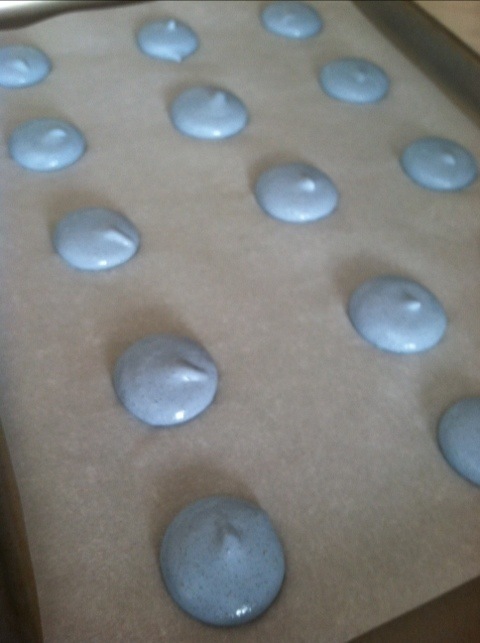 gorgeous pale blue Macarons! 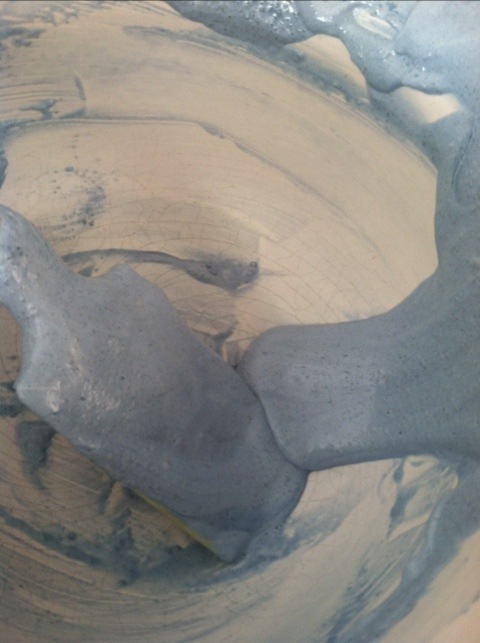 I love the color, in fact it’s the color of my kitchen walls and my bedroom walls! Such a pale, soothing blue, love it!! In fact I was so convinced of my success today, I even wore pale blue earrings. (blue topaz, $9.99 with a matching pendant on 1SaleADay)And they just taste, well, incredible! I’m trying to talk myself out of, oh, cookie number 7 or 8 right now? 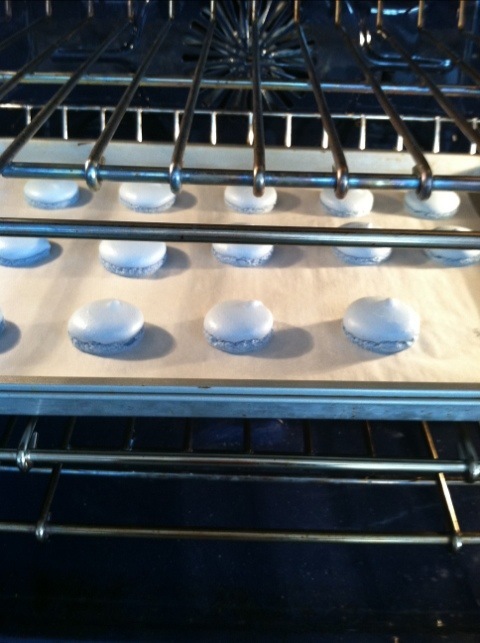 I’m going to tackle another batch tomorrow, as I have egg whites aging on the counter. My husband will be enjoying creme brûlée in the next week, all those yolks! This entry was posted on March 28, 2012 by katespadegirl. It was filed under Desserts and was tagged with almond, buttercream, Macarons.